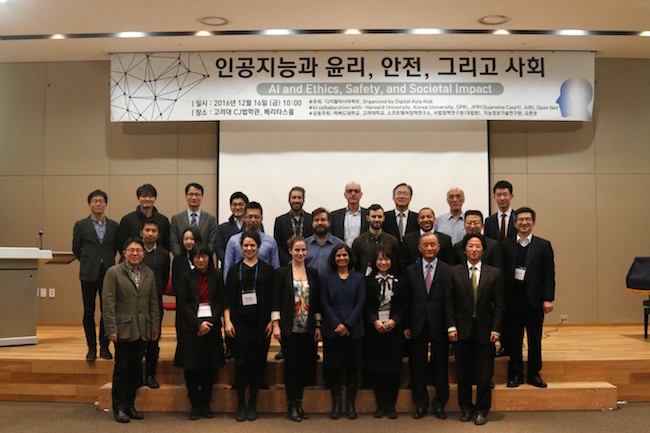 Digital Asia Hub, in collaboration with the Berkman Klein Centre for Internet and Society, held the second AI in Asia workshop titled ‘AI in Asia: Ethics, Safety and Societal Impact’ on December 16, 2017. Digital Asia Hub invited experts from across Asia, Europe and the U.S., including among them leading lawyers, data scientists, ethicists, engineers, social scientists, and entrepreneurs, among others. The day-long workshop consisted of five panels: AI and Ethics, AI and Law, AI and Safety, AI and Societal Impact, AI and Transparency. The workshop also included opening keynote addresses by Dr. Urs Gasser, Executive Director, Berkman Klein Center for Internet & Society at Harvard University, Chairman of the Board, Digital Asia Hub, and Dr Jin-Hyung Kim, Artificial Intelligence Research Institute (AIRI). This workshop was held at the Korea Law University, Seoul, in partnership with Korea University Legal Research Institute, the Artificial Intelligence Research Institute (AIRI), the Software Policy & Research Institute (SPRi), the Judicial Policy Research Institute of the Supreme Court of Korea, and Open Net Korea. Our three-city series titled “AI in Asia” launched in Hong Kong on 21st November. Designed as a framing event for the region, it brought together a fantastic group of scholars, policymakers, investors, technologists and artists. The final workshop “AI in Asia: AI for Social Good” will be held at Waseda University in Tokyo on March 6-7, 2017. Digital Asia Hub will release a white paper on AI in Asia once the series of workshops are completed. Follow #AIinAsia on Twitter for comments, pictures and more! This entry was posted in AI in Asia, Events and tagged AI, AI in Asia, Digital Asia Hub, ethics. Bookmark the permalink.